Recent exploration revealed a number of rare earth element (REE) deposits that are distributed along the Qinling Orogenic Belt, Central China. These deposits have an estimated total reserve of about 2 Mt. REE2O3, thus making this belt a world-class REE metallogenic province. Understanding the metallogenesis of the belt requires direct dating of REE minerals. 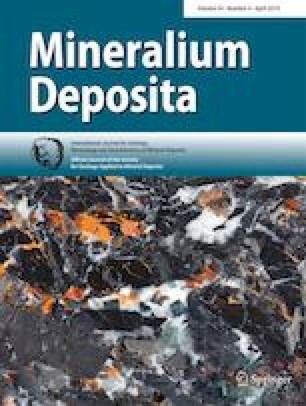 In this study, LA-ICP-MS U-Th-Pb dating on bastnäsite and monazite from the Huangshuian, Taipingzhen, and Miaoya deposits in different units of the belt was used to precisely determine the timing of the REE mineralization. The Huangshuian deposit in the north is a carbonatite-related Mo-(REE) deposit in which the REE minerals are closely associated with molybdenite. After correction for common Pb and excessed 206Pb decayed from 230Th, a weighted average 206Pb/238U age of 207 ± 4 Ma (n = 17; MSWD = 1.9) is obtained for bastnäsite grains from this deposit. Such an age is slightly younger than that of the final collision (peak at 230–220 Ma) of the Qinling Orogenic Belt, thus indicating that the Mo-REE mineralization is likely related to a post-collisional extension setting. The Taipingzhen REE deposit in the middle contains sheet-like ore bodies composed of veins where bastnäsite, the dominant REE mineral, is closely associated with quartz, fluorite, and barite. In situ bastnäsite U-Th-Pb dating shows that the REE mineralization in this deposit has formed at 421 ± 7 Ma (n = 17; MSWD = 1.5), synchronous with extension-related magmatism in the region. The Miaoya deposit in the south is the largest one in the belt, and it is essentially a REE-mineralized syenite-carbonatite complex. In this deposit, the monazite grains are closely associated with major minerals of the syenites or carbonatites (e.g., K-feldspar or calcite), but commonly exhibit complex internal textures. Different domains of monazite yield two groups of U-Pb ages at 414 ± 11 Ma (n = 5; MSWD = 0.91) and 231 ± 2 Ma (n = 21; MSWD = 3.1), whereas the bastnäsite has an age of 206 ± 4 Ma (n = 14; MSWD = 1.5). The early age of 414 Ma is obtained from homogenous monazite grains and in good agreement with zircon U-Pb ages of the Miaoya syenite-carbonatite complex, and thus is considered to represent the timing of the major REE mineralization in the deposit. The younger ages of 231–206 Ma are obtained from monazite grains with complex internal textures and bastnäsite in late veinlets, thus recording secondary, consecutive REE remobilization events likely related to the compression process during formation of the Qinling Orogenic Belt. Our new U-Th-Pb ages, in combination with previously geochronological data, demonstrate that there are two episodes of REE mineralization at 440–410 Ma and 220–200 Ma in the Qinling Orogenic Belt. The online version of this article ( https://doi.org/10.1007/s00126-019-00875-7) contains supplementary material, which is available to authorized users. This study is supported by the National Key R&D Program of China (2017YFC0602302) and Key Research Program of Frontier Sciences, CAS (QYZDB-SSW-DQC008).